Chamber members have access to Canada's largest employee benefits plan targeted to small-to-medium sized business. Introduced over 35 years ago Chambers Plan now provides coverage to over 29,000 firms like yours. Regardless of the size of your organization Chambers Plan can be customized to meet your needs, Request a quote today and let us show you how we can customize a plan for you. 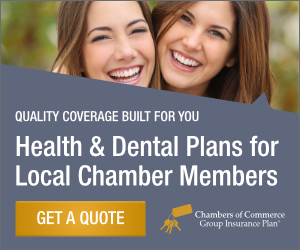 Chambers Plan Group Health Insurance has operated continuously for over thirty five years. Your firm's rates will remain stable regardless of claims history. Additionally, Chambers Plan Group Health Insurance is non-cancellable due to any claims experienced by your firm. Your company will never be singled out for a rate increase, ever. Your business is unique so your business needs unique coverage. That is why a local Chambers Plan Advisor administers your employee health benefits plan. A Chambers Plan Advisor is a member of your community. Whether you want to add dental coverage, change or update, or simply ask a question your Advisor is there for you.